My husband, daughter, and I don’t even need to wear mosquito repellent when my son is around. Mosquitoes find him no matter what he’s wearing and no matter how much we’ve sprayed and slathered him with mosquito repellent. The mosquitoes will find the small parts of his body that we missed. The problem is real; mosquitoes are dangerous. How to protect against mosquitoes? While mosquitoes are unlikely to go away anytime soon, they are a problem that can be dealt by taking some precautions. It’s important to learn why mosquitoes are a serious issue and how to protect against mosquitoes. Both male and female mosquitoes feast on nectar. Only the female mosquitoes seek out the protein in blood for her eggs. Female mosquitoes lay over 100 eggs at a time. There are 3,000+ species of mosquitoes. All mosquitoes need water to breed, so eradication and population-control efforts usually involve removal or treatment of standing water sources. Insecticide spraying to kill adult mosquitoes is also widespread. However, global efforts to stop the spread of mosquitoes are having little effect, and many scientists think global warming will likely increase their number and range. There are a number of ways people can protect themselves against mosquitoes. Insect sprays can be effective for personal use, provided that they have a DEET component. You must cover your ankles, neck, elbows, and wrists especially. Mosquitoes have a way of finding you! Cover your body with light-weight, long sleeve shirts, pants and socks. When it’s hot, it’s natural to want to wear tank tops and shorts. Find a long sleeve shirt you can put on when it’s dusk. Travel hat. Choose well, and your travel hat can work for bug protection also. Citronella candles have long proven to be effective at warding an area against mosquitoes, allowing a group to enjoy a summer evening. For those looking for other solutions, mosquito netting is a definite option. The finely meshed netting prevents mosquitoes from reaching their intended prey while allowing for air circulation. We tried one, and our mosquito net review is below. While staying indoors at dusk and dawn is also effective, it is probably not the best long-term solution, especially for active individuals. 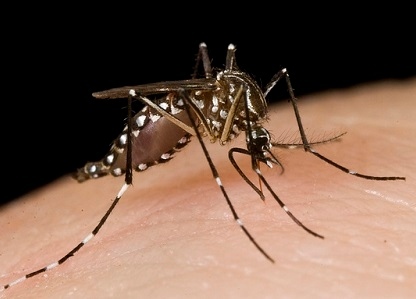 Ultrasonic devices may keep mosquitoes away by making it uncomfortable for the insects to be in the area as well. These haven’t been proven effective, but many consumers feel they’ve had success. Running the air conditioner can help as mosquitoes avoid areas with moving air and cold, even though that may not be a foolproof solution. A bug zapper can also be an effective way to deal with mosquitoes as well. There are organic ways to keep mosquitoes away from your home like keeping standing water your of your yard and keeping the lawn maintained. Wherever you are, it’s important to keep yourself and your family safe from mosquitoes. When you are outdoors for long periods, and especially when you are camping, it’s critical to protect yourself from mosquitoes. When you are traveling, it’s important to be vigilant about protecting yourself from mosquitoes. A mosquito net for travel is a great way to protect yourself while sleeping. Mosquito nets should be versatile. It should work in many different situations. Whichever mosquito net you buy, be sure it is a good mosquito net for camping as well as for sleeping when you have a bed. When vacationing in a tropical climate, many lodging options include open air sleeping arrangements where you have a roof but some of the sides are open. 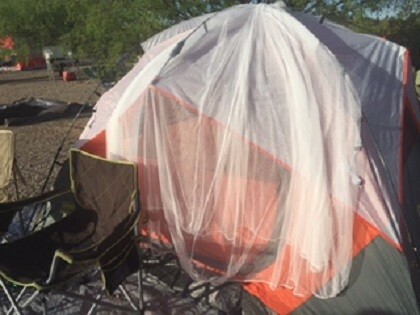 We tried a Universal Backpackers king size mosquito net. Using a mosquito net is a great way to protect against mosquitoes. Mosquito net fabrics are tightly woven. They allow for airflow while keeping mosquitoes and other insects away. The mosquito net we used has an attachment to use when you want it to cover your bed. You will need to be able to secure it to something on the ceiling. Just know it might not work everywhere, and you may have to improvise. We tried the mosquito net for camping. We weren’t in a mosquito-laden area but we wanted to see how it would work with a tent before mosquito season. Our tent had an interior center hook which would have made it easy to attach the net and arrange it around our sleeping bags. However, instead we draped the net on the outside of the tent, by the door. It worked well. It stayed in place while we went in and out of our tent. We will have my son take this net on his scouting backpacking trips when he needs to travel light. We will bring this on all our camping trips. You can even cover yourself with it (remove the ring for hanging) in a cot or on the ground in a sleeping bag. It is designed to hang from the ceiling to cover a king-sized bed, but we found it to be very versatile. It is king-sized, and fits any bed, cot, etc. It measures approximately 35 feet in circumference and over 7 feet in height. This mosquito net will reach all the way around your mattress. Not only will this eliminate mosquitoes from entering but it eliminates creepy crawlies too. Easy to get out of bed. While it’s easy to securely fasten your net around your bed, it’s also easy to loosen to get out of bed during the night and in the morning. So many mosquito protection products involve chemicals. This net is made from 100% polyester and made according to World Health Organization guidelines. Easy to wash. I wash everything when I return home from traveling. This mosquito net is easy to wash. Simply remove the hanging spring ring so it doesn’t tear while washing. You can use this in many ways: backpacking mosquito net, camping mosquito net, open air sleeping mosquito net, in hotels, for other traveling, at home, etc. Easy to carry, pack and store. Our mosquito net came with a small bag which keeps it from snagging and is easy to pack as well as to store away. There are many types of mosquito nets at Walmart and other retailers but we found ours on Amazon. One drawback, and it may or not be relevant to your situation, is that you may be somewhere without the ability to hang this mosquito net over your cot, bed, etc. If that happens, you can easily drape it over yourself. While a pop up mosquito net tent or a mosquito net cot is a great idea, we like mosquito nets that are versatile enough to use in many situations. Mosquito are considered the most dangerous animals in the world. They carry diseases which account for one million deaths. Mosquitoes are more than just a nuisance; they are a serious problem. Mosquitoes are carriers for deadly illnesses, diseases, and viruses, and contribute to global infectious disease. Mosquitoes cause millions of deaths worldwide. Populations most affected are children and elderly populations in developing countries. They also transmit diseases and parasites to horses and dogs. While there are thousands of species, there are three types that spread diseases. Diseases are the reason it’s critical to know how to protect against mosquitoes. Carry encephalitis, filariasis, and the West Nile virus. It’s generally found in tropical and subtropical regions. They also transmit filariasis (also called elephantiasis) and encephalitis. They are mostly found in tropical regions. Carry yellow fever, dengue, and encephalitis. These mosquitoes live everywhere except Antarctica. Yes, mosquitoes are actually good for something. Remember, there is a purpose for practically everything in nature. Mosquitoes are the lower end of the food chain, and many animals rely on them for food. Bats, birds, dragonflies and others eat mosquitoes. Mosquitoes, most prevalent in warm areas with lots of standing water, thrive in many areas. They are mostly found in tropical areas, but can be found in any area that has some sort of standing water. This is why they are found in so many areas throughout the world. While they are most prevalent in the tropics, they are found in almost every location on the planet excluding Antarctica and polar and sub-polar regions. Because of their ability to spread disease, there are a number of mosquito abatement programs, including agencies throughout the world to minimize and contain the mosquito problem. Programs involve aerial spraying, eliminating standing water, and even increasing the number of fish species that feed on mosquito larvae as well. Newer programs, ones that looking at ways to make mosquitoes sterile, also encourage mating with sterile specimens. Some programs seek to make people proactive, and encourage adding minute amounts of bleach or oil to any source of water. The bleach kills the larvae while the oil makes it difficult for the larvae to obtain oxygen. The first is that the insects adapt quickly to a wide variety of environmental problems, enhanced by their short lifespans. They can usually adapt to almost anything within a few years as long as at least some of the mosquitoes survive, and they can find some water to breed in. The other is that they can breed wherever they can find water, which can be anywhere from a small pond to used tire that has captured some water. As such, they are formidable opponents for their size. Take precautions, and learn how to protect against mosquitoes. It’s essential to keep up on vaccinations and to stay vigilant about your health. Mosquitoes are an unfortunate part of life in a lot of areas, and one that needs to be dealt with. It is just a matter of finding the best solution for your situation.